ON A LONELY island far from his friends and his homeland sat an old man. This old man was a Jew. 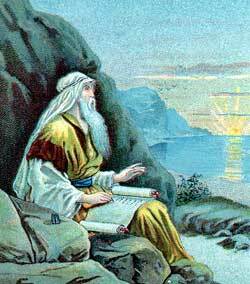 In his younger days he had been a fisherman, and his home had been near the Sea of Galilee. But one morning he had left his fishing-net to follow a dear friend, and always from that time he had tried to please this friend. The time came not long afterwards when this friend went away, to heaven; but never again did the young man return to his humble toil by the seaside. Hereafter he became a preacher of the gospel, for his friend was Jesus. He was one of the twelve apostles of Jesus. One day while John was on the island he sat thinking about God. He remembered how the Christians always met together to worship on that day, which they called the Lord’s day, because Jesus had risen from the grave on the first day of the week. John saw that people from every nation of earth dwelt in that city, people whose sins had been forgiven because they believed in Jesus. He saw that nothing unclean or impure entered that city, and only those were admitted whose names were written in heaven’s book.